Nestled at the confluence of the Mekong and Nam Khan rivers, in northern Laos, Luang Prabang is considered the heart of Laotian culture. This ancient royal town and UNESCO-World Heritage Site still retains an ethereal ambiance. Much of the town’s allure is the plethora of golden ‘Wats’ – Buddhist temples and pagodas. Two of the most celebrated are 16th century Wat Xieng Thong, which epitomises the elegance of the regional architecture and Wat Khili, housing priceless Lao Buddhist archives. 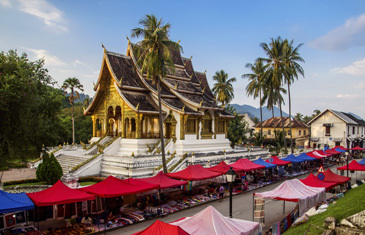 Our day concludes with a sunset cruise along the Mekong River and visit to Luang Prabang’s night markets, when the side-streets are crammed with food stalls. Enjoy the sights, sounds and aromas as our guide explains local cooking techniques and ingredients. Later, we dine at a restaurant specialising in traditional Lao, barbecue-style dining. We take a river cruise by long-tailed boat to Pak Ou Caves, positioned where the Nam Ou and the Mekong rivers converge. Perched high on a limestone cliff, these two cave temples are home to approximately 4,000 sacred Buddhist statues and images. Returning to Luang Prabang, we stop at Ban Muang Keo Village, where local weavers and whisky distillers practice age-old artisan craftmanship. The evening brings on an unforgettable dining experience at Belmond La Residence Phou Vao, one of the area’s most luxurious hotels. In a pavilion set in pretty heritage gardens, indulge in a seven-course Lao menu, partly prepared at your private table. The romantic scene is further accentuated by a traditional Lao music performance and glow of 500 candles. Located in northwest Cambodia, the provincial town of Siem Reap is gateway to Angkor Archaeological Park, a UNESCO World Heritage site containing the stupendous remains of a former Khmer Civilisation. As darkness falls, we are whisked away on a tuk-tuk by our personal guide. 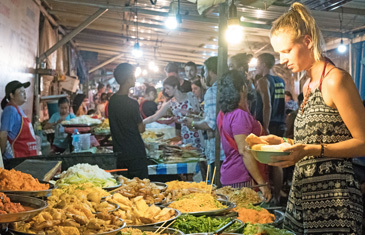 On-the-go tasting stops at street corners, alleys and old market area, provides us with not only the opportunity to gain genuine insight into local-style Khmer cuisine, but also taste the huge array of street food available. Even better, washed down with a local Angkor beer. We continue onto Angkor Kyung Yu, otherwise known as ‘Road 60,’ a popular local haunt for the numerous food stalls lining the street. 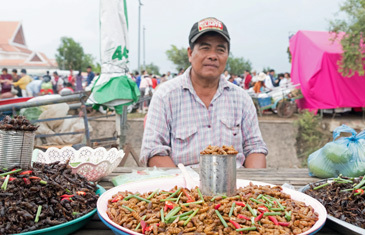 Here, sample some exotic fruits and sizzling, grilled meats and if you are adventurous, the local delicacy of fried insects. We explore the astounding temples within the Angkor Archaeological Park. One of the largest, Ta Prohm, a 12th century Buddhist temple, is instantly recognizable for its gnarled tree roots growing through the temple’s massive stone blocks. 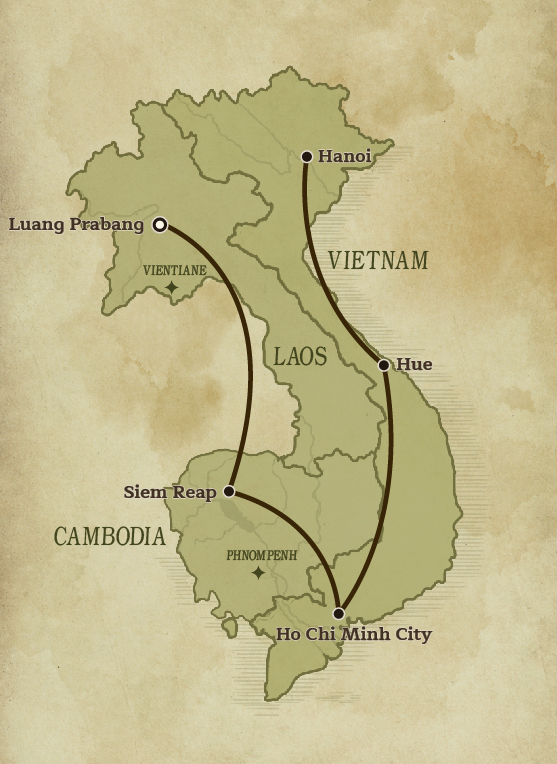 We continue on to Angkor Thom, an entire inner walled city, which served as the Khmer Empire’s ancient royal capital. The centrepiece, Bayon Temple, is distinctive for its 216 giant serene faces carved into stone towers. The 12th century Angkor Wat, however, is the crown jewel, ranked as one the world’s greatest ancient wonders and largest religious monument. An evening’s performance at daringly modern, ‘Phare’ Cambodian Circus, presents an alternative look at Khmer culture. Beforehand, we enjoy a Khmer-style dinner at Madame Butterfly Restaurant, housed within a restored wooden house. A mountain bike ride through Siem Reap’s surrounding bucolic countryside reveals a more authentic Cambodian experience. At a bustling local market, our guide arranges a tasting session of street food snacks, such as coconut sticky rice balls. We also receive a spiritual blessing in a private ceremony conducted by Monks at a sacred Buddhist pagoda. Later, a chef guides us around a private farm, explaining how seasonal, organic vegetables are cultivated. Chef takes us to a traditional Khmer village, where we engage with the villagers and select ingredients for our cooking class. As a goodwill gesture for our memorable day, we ceremoniously donate a basket of goods to the Village Chief. Back at the farm, chef helps us create a three-course lunch, showcasing iconic Cambodian dishes. Although Saigon (Ho Chi Minh City) has rapidly developed into a modern metropolis, remnants of its momentous past are still evident in historic landmarks. Saigon is also renowned for its authentic street food and Saigonese culture of constantly eating out. As night falls, the city ramps-up an infectiously buzzy vibe. Soak in the atmosphere while sitting on the back of a vintage Vespa as your driver takes you through busy streets and off-the-beaten path alleyways. We have tastings at several local food eateries and hidden cafes. Amongst these, at a half-century-old dessert shop, we taste Che, a sweet soup. Our culinary experience starts at Ben Thanh Market, one of Saigon’s oldest markets, where, assisted by our guide, we select fresh ingredients for our cooking class. This is exclusively hosted at a former U.S. Ambassador’s Residence, during the 1960s. Today this historic villa has been restored to its former glory. A guided tour reveals the stunning fusion of Vietnamese, French and American architecture. Later, our chef presents a private hands-on cooking demonstration, featuring typical Southern Vietnamese dishes and the art of presentation. Due to the history, climate and Southeast Asian influences, Southern cuisine has its own distinct style. Dishes are invariably sweet, spicy and sour, infused with vibrant and robust tastes. In central Vietnam, the Imperial City of Hue still bears the remnants of its majestic royal past. From 1802 to 1945, Vietnam’s former capital was home to 13 Nguyen Emperors, who led an intriguing court life. This ancient city is also Vietnam’s epicentre of Buddhism, home to many prominent Buddhist pagodas. Most Buddhists believe that maintaining a vegetarian diet helps reduce bad karma, accumulated from previous lives. 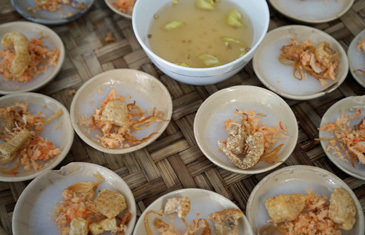 Some of Hue’s best vegetarian food is found at Dong Thuyen Pagoda, secluded atop a verdant hill. Within the tranquil 18th century pagoda, a delicious vegetarian meal is prepared by the resident Buddhist nuns. Much of the fresh produce used originates from the pagoda’s organic vegetable gardens. Hue is renowned for its distinctive royal cuisine and intricate food carvings, handed down the generations. 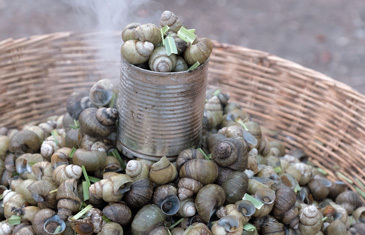 Much of Central Vietnam’s traditional recipes and culinary techniques are a direct legacy of the Imperial kitchens of the Nguyen Emperors. Who better to reveal more about the intricacies of Hue’s culinary heritage than our host for the day – a celebrated gastronomy artisan, cook book author and TV food host. She personally guides us through the city market to experience the colourful sights and aromas of the fresh local produce. 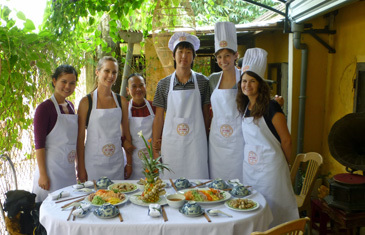 Later, at her private residence, our artisan host presents an exclusive hands-on cooking class of traditional Hue dishes, which are sampled at a convivial sit-down meal. Hanoi street food is some of Asia’s finest cuisine and the best way to sample it, is local-style ‘on the street.’ Guided by a renowned food blogger, our bespoke street food tour covers Hanoi’s most authentic eateries. As we stroll through the historic Old Quarter, we sample local delicacies and learn more about regional Vietnamese food. A visit to bustling Thanh Ha Market presents a microcosm of Hanoi’s daily life and street culture. On Hang Than Street, known for its ceremonial cake stalls, we sample a popular French-influenced dessert, while on Hang Cot Street, we taste typical Vietnamese snack. Café culture is a huge part of Hanoi life. No visit to the Old Quarter would be complete without stopping off at a typical coffee shop, sipping a robust, Vietnamese coffee.